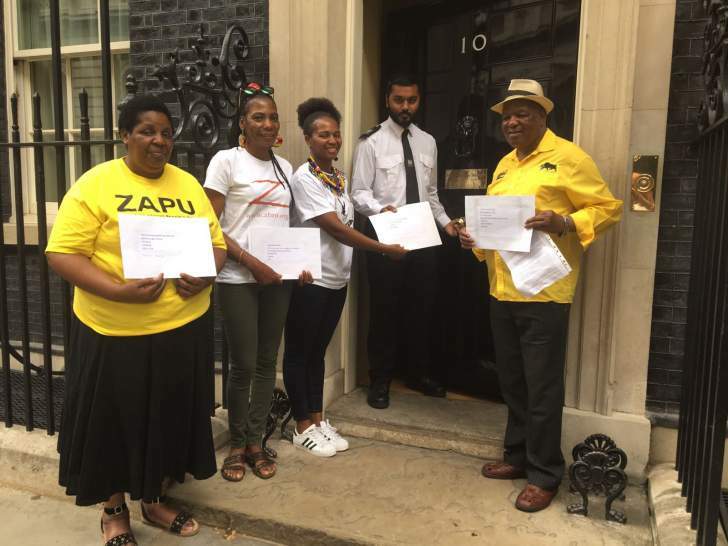 ZHRO joined up with ZAPU UK to hand in a petition seeking the recognition of Gukurahundi atrocities on Thursday 19 July 2018. The big wave of executions of civilians in Matabeleland between 1983 and 1987 is the worst case of human rights violations in Zimbabwe. The petitioners met at the Zimbabwe Embassy on Thursday 19 July 2018 and marched to number 10 handing out Gukurahundi awareness leaflets on their way to deliver the petition to number 10 Downing Street. The petition was handed in by Arthur Assa Molife of Zimbabwe African People's Union (ZAPU) and Matebeleland Gukurahundi Victims (MGVDA), Sibongile Bvungidzire of ZAPU, Rashiwe Bayisayi of ZHRO and Charity Ndebele of (1893 MHRRM): 1893 Mthwakazi Human Rights Restoration Movement. "This is a crime against humanity - and it is time to bring the culprits to justice - not to embrace them," said Rashiwe Bayisayi. "We want the British government to acknowledge that those responsible for the massacre of 1983-1987 in Matabeleland are among the highest officials of the Zimbabwean regime and continue to use violence against what they see as dissidents. Bringing those responsible for this great crime to humanity is essential to prevent a repeat of these heinous crimes and crimes against humanity. The U.K. government and the entire international community has a shared responsibility to this effect," said Arthur Molife. The petition indicates the diaspora's dissatisfaction with the then U.K. Government concerning its failure to acknowledge a genocide, and that 'lessons need to be learned' about such flagrant human rights abuses. Now the petition implores the current UK Government to lead an International Campaign to fully recognise the Genocide in Matebeleland and the Midlands, and to bring all the perpetrators to justice. It points out that this process of Truth and Reconcilliation is vital in order to unify all Zimbabwe - it cannot and must not fall under the spell of "let bygones be bygones"
There is sufficient evidence in communications at the time to identify those who were "fully aware" of what was happening in Matebeleland and the Midlands - these include the current Coup Installed President. "We call on the government of the United Kingdom to recognize this barbaric act as genocide and to condemn the actions of the authorities of the time - Mugabe, Mnangagwa, Shiri and many others - which allowed this to happen," said Charity Ndebele representing 1893 Mthwakazi Human Rights Restoration Movement. Therefore we, implore the Government of the United Kingdom and the other Bodies to fully take cognisance of this clear case of Genocide by both International Condemnation and by the establishment of an International Truth and Reconciliation body. The current regime has no appetite to admit any wrong doing of any of its leaders both past and present. This attitude casts serious issues of credibility onto their current iteration of a Zimbabwean Truth and Reconciliation body. Perhaps the "Lessons Learned" are those by the International Community in allowing such Genocide to be left 'unacknowledged' by the very perpetrations, who to this day rule Zimbabwe.